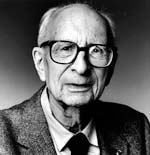 Last year saw the passing of Claude Lévi-Strauss, an innovator of anthropological studies and an expert on non-western myth and culture. His work has had lasting effects in cultural and anthropological studies and his legacy is as controversial as it is influential. Lévi-Strauss’ life also intersected that of Meyer Schapiro’s. In 1941, Lévi-Strauss was invited to become a visiting professor in the New School for Social Research in Manhattan and he was friends with the anthropologist Franz Boas. At the time, Boas was the eminent espouser of what would become known as modern anthropology. It is alleged that Boas died in the hands of Lévi-Strauss in 1942 after a dinner held at Columbia’s Faculty House. Indeed, Lévi-Strauss, like Boas, worked across disciplines to cultivate his theses. Working across philosophy, anthropology, sociology, and the pure sciences, Lévi-Strauss wove a tapestry of thought into how mythology plays a large role in constructing societies. Lévi-Strauss’ work jarred Anglo-Saxon academic circles by upending how people perceived so-called "primitive cultures." He did this by traveling, studying, and living with different tribal cultures across the Americas and his written work demonstrates the complexity with which indigenous tribes create their systems of belief and society. As Lévi-Strauss would articulate in his 1977 Massey Lecture: "What I tried to show in Totemism and in The Savage Mind, for instance, is that these people whom we usually consider as completely subservient to the need of not starving, of continuing able just to subsist in very harsh material conditions, are perfect capable of disinterested thinking; that is, they are moved by a need or a desire to understand the world around them, its nature and their society. On the other hand, to achieve that end, they proceed by intellectual means, exactly as a philosopher, or even to some extent a scientist, can and would do." Like Lévi-Strauss’ thinking on how mythology constructs ways of thinking, Schapiro was also interested in how form and content conveyed societal and cultural patterns. And, in this regard, both men played fundamental roles in shaping how anthropology and art history are studied respectively. Because Lévi-Strauss was in Manhattan in the early 1940s, he undoubtedly met Schapiro via the Columbia connection with Boas. The first instance of correspondence between the two was in 1944, while Lévi-Strauss was teaching at the "Latin American Center" at the New School. It was in July 24,1963, however, when Lévi-Strauss wrote Schapiro with a favor: "In order to illustrate a forthcoming book on mythology, I need a painting (or preferably a drawing) some old master, either known or unknown, representing live animals jumping into a cauldron set on a burning fire, or else throwing themselves upon the pit. This obviously would have to do with the ‘land of plenty’ cycle. I have looked through Callot, Flemish Renaissance painters, Italian popular drawings, and was unable to find anything. Would you by any chance, with your tremendous knowledge of medieval iconography, remember something along those lines?" 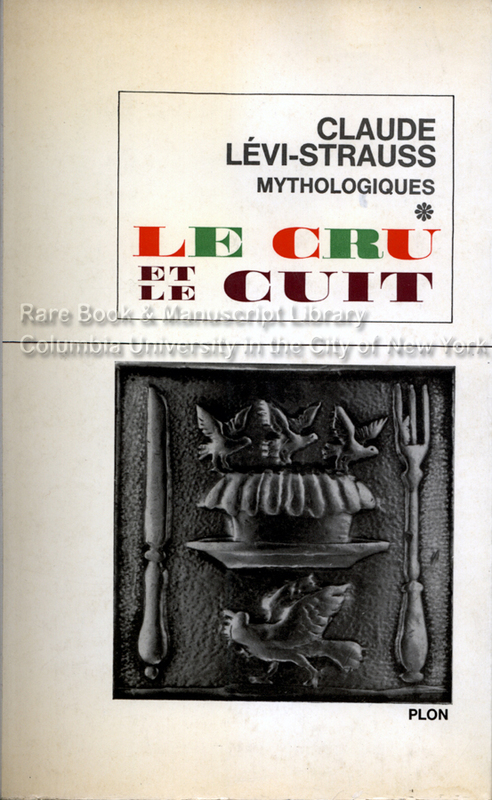 Given that Lévi-Strauss was writing in 1963, the book he mentions is undoubtedly the Le Cru et le Cuit (The Raw and the Cooked) the first volume of his four part "Mythologiques." 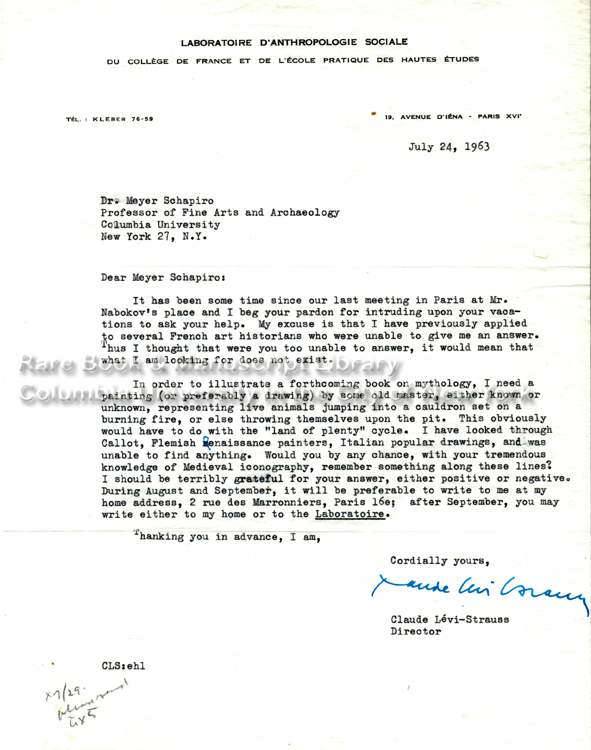 Schapiro replied to Lévi-Strauss on July 27, 1963 with advice, but it seems that the two never really pinned down the exact image Lévi-Strauss was looking for. 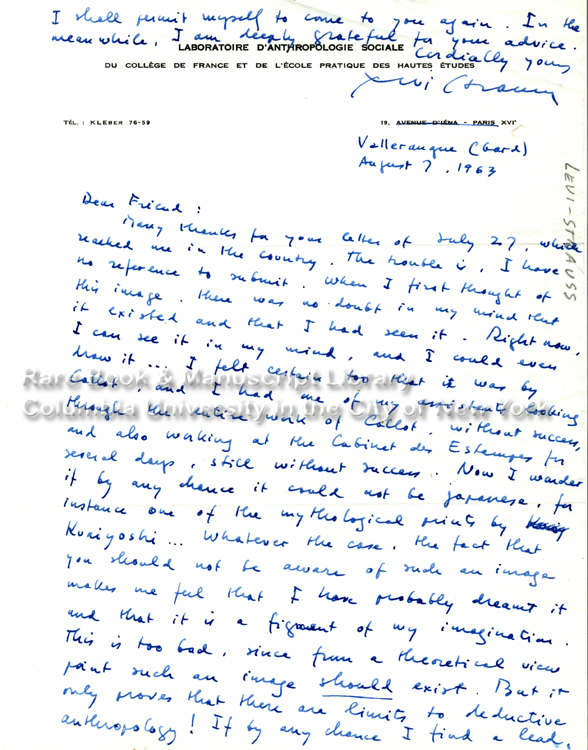 In August 7, 1963, Lévi-Strauss would write Schapiro: "Many thanks for your letter of July 27, which reached me in the country. The trouble is, I have no reference to submit. When I first thought of this image, there was no doubt in my mind that it existed and that I had seen it. Right now, I can see it in my mind, and I could even draw it … I felt certain too that it was by Callot, and I had one of my assistants looking through the entire work of Callot, without success, and also working at the Cabinet des Estampes for several days, still without success. Now I wonder if by any chance it could not be Japanese, for instance one of the mythological prints by Kuniyoshi … Whatever the case, the fact that you should not be aware of such an image makes me feel that I have probably dreamt it and that it is a figment of my imagination. This is too bad, since from a theoretical view point such an image should exist. But it only proves that there are limits to deductive anthropology!" 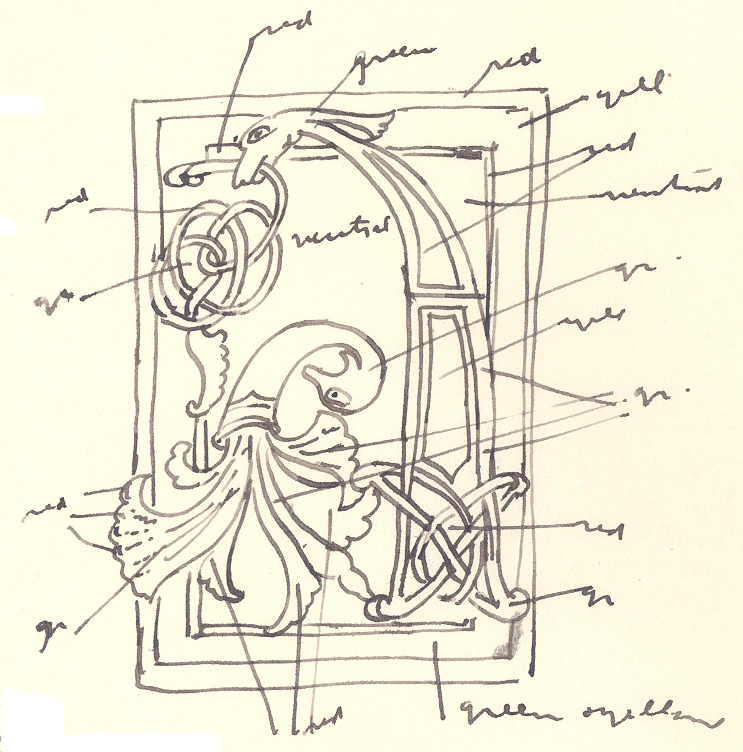 Judging from the image used in the first printing of Le Cru et le Cuit in 1964 by the publishing house Plon, Lévi-Strauss did in fact find an image very similar to what he was describing. While he was looking for live animals jumping in a cauldron, he found live birds jumping into a pie: an English silver repoussé from the 19th century that illustrates the famous nursery rhyme and that is housed in the Louvre. While Lévi-Strauss may not have used "deductive anthropology" to find this cover illustration, it shows that his theory may prove a point: myths cross time and cultures to become an illustrative map of diverse societies. This entry was posted in Claude Lévi-Strauss, Franz Boas on January 20, 2010 by Administrator.